Associate Professor, Academic Staff College, University of Calicut, Calicut University PO, Malappuram - 673635, Kerala, INDIA. Background: Salt glands are highly specialized epidermal structures developed in recretohalophytic plants, intended for salt storage (reservoir) and as a means to alleviate the salt stress of the saline habitat by exo-recreto releases excess salts from the mesophyll tissues to the surrounding environment. Plumbago zeylanica Linn belongs to the family Plumbaginaceae is an important medicinal plant and espoused as a source for the drug Chitraka. 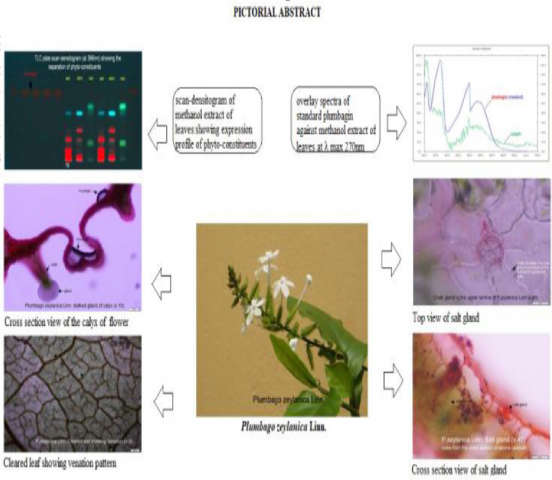 Aim: The present study concerns the delineation of micromorphological characteristics of the paradermal and cross sections of the leaf epidermis, lamina, salt glands, petiole and mucilage secreting glands of the calyx of the flowers of Plumbago zeylanica Linn. Materials and Methods: Delimiting the morpho-histological profile of the leaves and to develop the chromatogram of the methanol extract of the leaves and quantification of the marker compound plumbagin in the leaves using High Performance Thin- Layer Chromatographic (HPTLC) method. Results: Distribution of uniseriate, cruciate type clothing trichomes, characteristic contour of midrib, presence of amphistomatic epidermis with anisocytic stomata, crystals in idioblast of ground tissues of petiole and mesophyll, large palisade ratio, small stomatal index, multicellular salt gland structure with 8 cells, cuticular secretory cells, crescent shaped petiole, densely distributed mucilage secreting glands on the calyx of flowers were features characteristic of the taxon. The HPTLC finger printing profile of the leaves revealed six phyto-constituents. Densitometric scanning of plumbagin had shown the absorption spectra λ max at 270 nm. Spectral matching by overlaying the absorption spectra of standard marker compound with the phto-constituents present in the methanol extract of sample could fail to obtain any spectral matching at λ max 270 nm, suggestive that dried leaves of P. zeylanica did not contain any appreciable amount of Plumbagin. Calibration data obtained by polynomial regression had revealed that dried leaves of P. zeylanica Linn contained below 105 ng/μl of plumbagin in methanol extract of leaves. Sudhakaran MV. Micromorphology of Salt glands and content of marker compound Plumbagin in the leaves of Plumbago zeylanica Linn. Pharmacognosy Journal. 2019;11(1):161-170.